Manchester United saw their perfect start to the season end, after they were held to a 2-2 draw at Stoke City on Saturday. 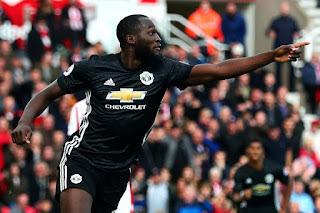 However, Romelu Lukaku moved clear at the top of the goalscoring charts. The Belgium striker struck his fourth league goal of the season, his first shot initially parried by goalkeeper Jack Butland before he fired home the rebound. However, two goals from Eric Maxim Choupo-Moting, denied the Red Devils victory. Manchester City moved level on points with United, after a 5-0 drubbing of 10-man Liverpool at the Etihad Stadium.